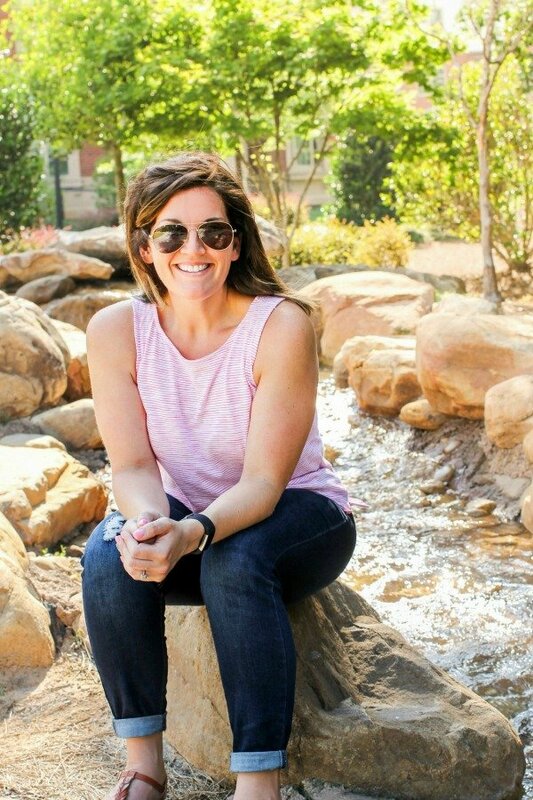 September 13, 2017 By Allyson 10 Comments This post may contain affiliate links. Read my disclosure policy. 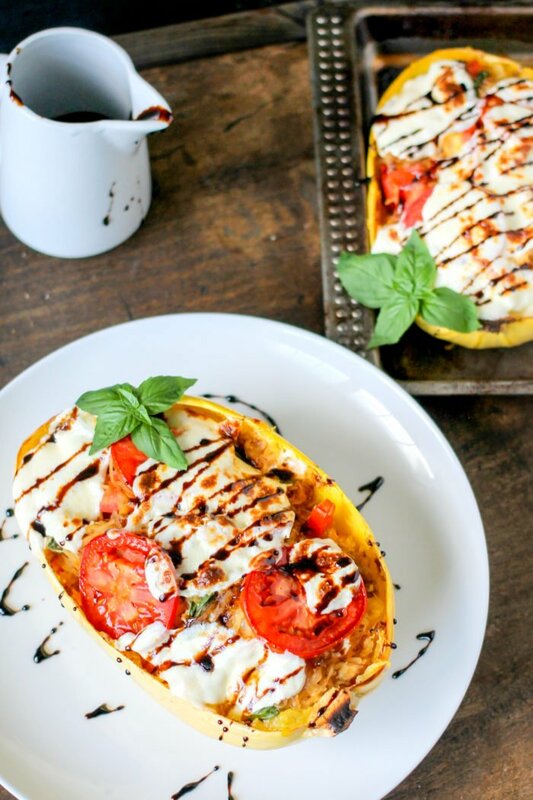 Caprese Stuffed Spaghetti Squash is loaded with fresh mozzarella, tomatoes, basil, and then topped with a delicious balsamic glaze! Perfect healthy dinner! If y’all follow Domestic Superhero, then you might know that I am OBSESSED with spaghetti squash! It’s really the best. Spaghetti Squash is SO low calorie that you can pretty much load it with whatever you want and not feel too guilty. 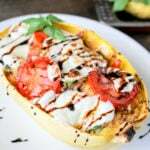 For this Caprese Stuffed Spaghetti Squash, you load it up with fresh tomatoes, mozzarella cheese, basil leaves, and then add a sweet balsamic glaze. They are the BEST! I feel like Caprese style anything is sort of a summery meal, but when you add it to spaghetti squash you can have it anytime! Spaghetti squash is a fall vegetable, so extending those summer flavors just puts me in a good mood. The cheese here is totally clutch, so don’t forget that fresh mozzarella! I love blasting it under the broiler for a few minutes at the end, that way the cheese gets a little toasty – yum! If you don’t know how to cook a spaghetti squash, don’t worry, it’s easy (see video below)! You basically cut the squash in half, then roast it for just under an hour. Let it cool off a bit, then use a fork to scrape out the ‘spaghetti’. Once you have the filling scraped out, you can proceed to make your Caprese Stuffed Spaghetti Squash! YUM! Preheat oven to 350 degrees. Cut squash in half, lengthwise. Remove seeds from inside. Drizzle olive oil over the inside, and rub to cover all flesh. Add dash of salt and pepper. Place face down on a baking sheet/dish. Bake for 45-60 minutes or until tender (time will vary depending on size of squash). Remove, let cool for at least 15 minutes, then using a fork scrape out the squash, while being careful not to poke holes in the skin. Set aside. Combine balsamic vinegar and sugar in a small pot. Bring to a boil over medium heat, then simmer for about 5-8 minutes or until thickened. Do not overcook or it will harden. Cut fresh mozzarella ball in half. Using one half, cut into small cubes. With the remaining half, slice into thin rounds, set aside. 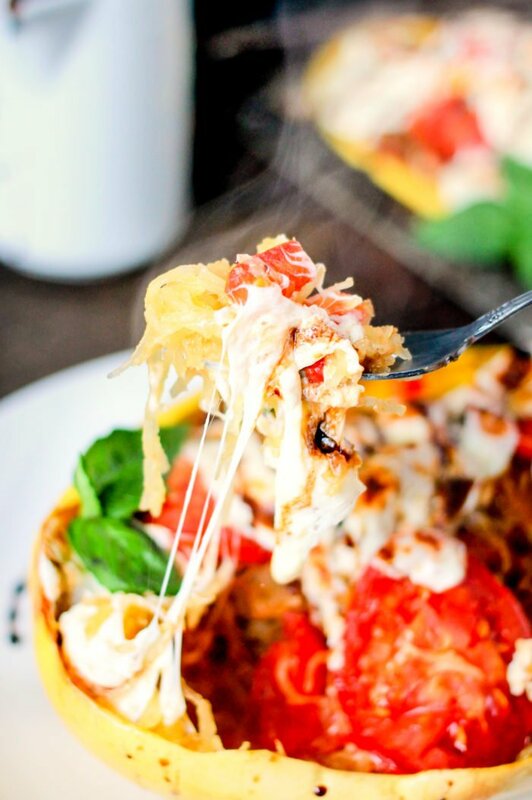 In a large bowl, add spaghetti squash filling, mozzarella cubes and 1/4 cup shredded mozzarella, chopped tomatoes (reserve rounds), basil leaves salt, and pepper. Mix together. Add about 2 TBS of the balsamic glaze, stir to combine. Scoop the mixture into both sides of the skin of the spaghetti squash. Top with mozzarella rounds and tomato rounds. Loosely cover with foil and bake for 15 minutes. Remove foil, turn oven to broil, and broil for 3-5 minutes, or until mozzarella is slightly browned (watch carefully as it can burn quickly). Remove from oven. Drizzle remaining glaze over the tops, serve immediately. The cheese factor on this is out of this world! Good mozzarella really does make all the difference. Looks fantastic! This looks so good and super comforting! 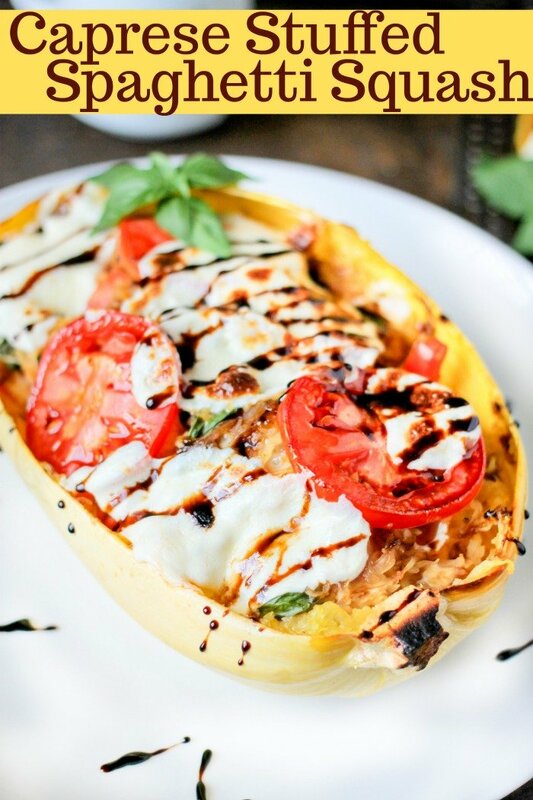 What a delicious way to use a spaghetti squash! 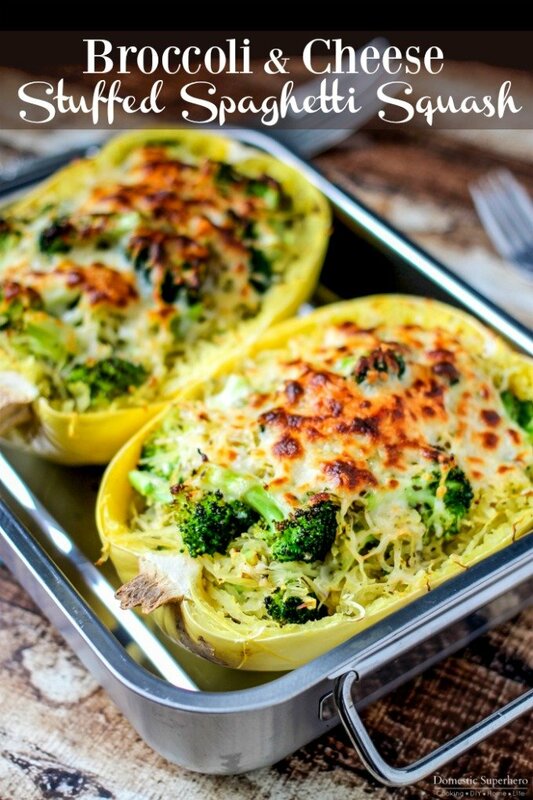 I love using spaghetti squash, so we’ll definitely be trying this one! OMG! That looks so inviting! Love it! This was made just for me! I love these flavors! Well, I have made it several times and it’s delicious! Lots of people have also commented on Facebook that they have made it with great success, but a lot of people don’t take the time comment on the actual blog post. Let me know if you try it! I tried it today and it was yummy. The balsamic vinegar glaze took it up a notch. Excellent! 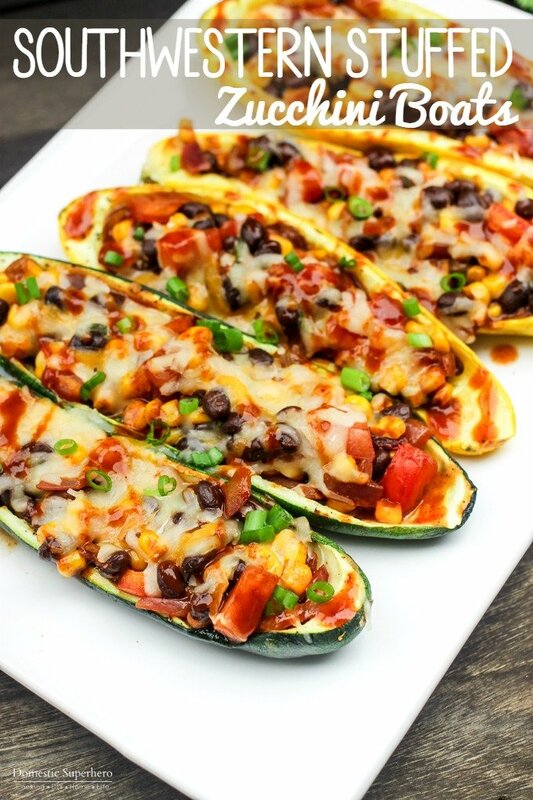 I used n a casserole dish instead of using the squash shells and it worked great. I did have a lot of water at the bottom of the dish which I think could be attributed to the mozzarella. So in a word, we loved it! My boyfriend and I had the Broccoli Stuffed Spaghetti Squash las night for dinner. It was amazing. So good, in fact, I’m making it again tonight for Girl’s Night. I will be adding cauliflower and mushrooms. Such a wonderful dinner.